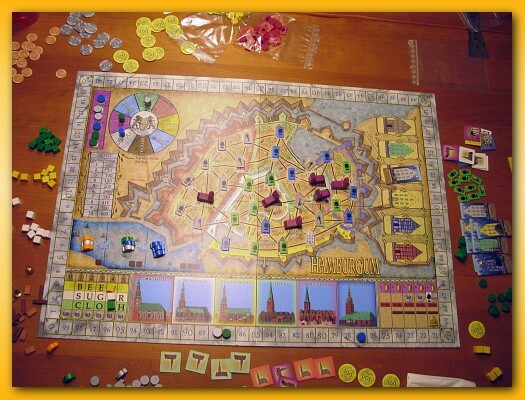 I received my copy of Rails of Europe about 5 months ago and I have yet to play it. So I cracked the box last night and reread the Railroad Tycoon rules (the base game that Rails expands) and set up for a solitaire game. It didn’t take long before I realized that there’s just too much going on to keep track of independent players to make it really a game. However, I did enjoy being able to work through the rules and, embarrassingly enough, fondle the bits. I’ll not go through the rules but in short, Rails is a good delivery game. Your job is to connect cities by building railroads between them. Once connected you can ship cubes between cities using the rail lines. Different terrain types affect the cost of the track and colored cubes must be shipped from their original location established at the beginning of the game to a city of corresponding color. You move up the victory point track when you ship cubes which earns you more money each turn. 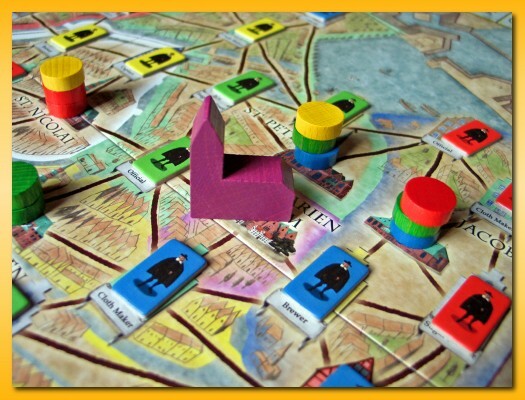 You’ll most likely need to sell shares in your company to raise cash to build rail lines but doing so forces you to pay dividends each turn reducing the cash you have available on your turn. 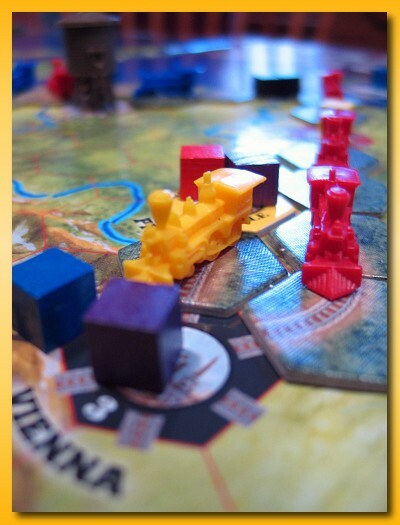 If you’ve played Ticket to Ride or Union Pacific, you might think this games are similar because there are plastic trains and you “build track” but the similarity is only superficial. Rails is much more of a “gamer’s game” and there are many more goals to think about, money to manage, and decisions to make about where to build. The smaller board brings players into contact much sooner than RT setting the stage for a potentially more challenging and confrontation game. The board is 2/3 the size of Railroad Tycoon and I thought I’d be fine playing without my dining room table opened up but, unfortunately, it’s very tight even with the smaller size. I beginning to think the only way I’m going to get a set of very specific games to the table will be to organize a special game night with the games already chosen. It was getting a bit late last night and there were only three of us but we decided to kick ourselves off the computers and play a game. Since it was late I scanned the titles in my collection and decided on something that wasn’t heady and if push came to shove, we could cut short. Winner’s Circle was the winner. Neither Noah nor Lisa had played before and it had been since October since I’d played but WC is extremely easy to teach and with only a couple pages of rules it doesn’t take much to get back up to speed. 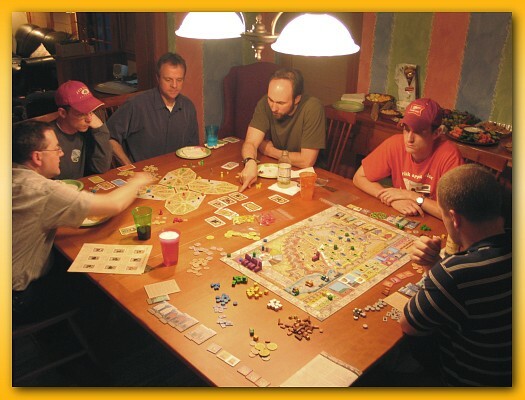 The game comes packed with a board representing a track, fat plastic horses in varying colors, thick cardboard placards depicting a horse’s abilities in 4 areas (horse head, saddle, helmet, horseshoe), some money chips, 4 betting chips per player, and a 6-sided die with 3 sides depicting a horse head, and the other three sides depicting saddle, helmet, and horseshoe. The game comprises three individual races. The horses are lined up and the placards are turned up and assigned to specific horses. In round robin fashion, players place bets on horses (a betting chip depicting 0, 1, or 2) until all 4 betting chips have been placed (you can’t bet on the same horse twice). Once all betting chips are down, the race begins and the starting player rolls the die. The player then chooses any horse and moves that horse forward on the track according to the number on the placard that matches the symbol rolled on the die. After moving the horse, the placard is turned over and the horse is not allowed to move again until all other horses have moved. The game does have some pretty significant back stabbing aspects to it since you can, for example, on a bad roll choose a horse you didn’t bet on and move them a small amount. Making situations worse is that it’s not allowed for horses to occupy the same spot on the track. If, when moving forward, your horse lands on an occupied spot, you must back up until the first free spot opens up (maybe all the way back to your original position). Congestion on the track can really devastate some moves restricting some horses from breaking out of the pack. The first horse that passes the finish line is moved to the center of the track followed by the 2nd and 3rd horse. When the 3rd horse crosses the line, the race is over and the horse in last place is moved to the center as the “last” horse. At this point, a payout occurs and using a chart on the board, players determine the value of a bet based on the finishing position of a horse and receive money based on the value of their betting chip. The 0 betting chip pays nothing but is used as a bluff bet since it looks as if you intend to split a reduced pot for the horse and may make others choose another horse. Players that have bet on the “last” horse owe money to the bank. That’s basically it, you set up for the next race and go again. The game is relatively random but fun. We played with the Royal Turf variant where you use the 0 betting chip and bets are secret (placed face down). 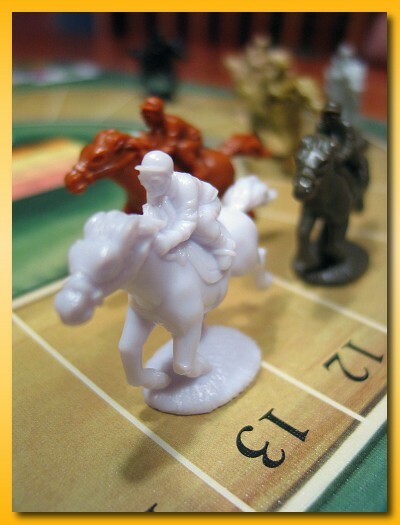 In addition the “horse head” value of the placard (the most common dice roll since it’s on 3 sides of the die) must be different for every horse in the race. It bothers me somewhat that the horses are always lined up in the same order behind the starting line and they don’t start from a flat start as in a real race. A variant I might like to try would be to turn up placards and place bets but then randomly assign the start order to represent the random nature of a good/bad start as the come out of the gates. Winner’s Circle is a chaotic bit of fun that is pretty much a crap shoot strategy-wise but I’m glad to have something like it in my collection. If you can find a copy just about anybody can play (gamers and non-gamers) and the theme ties in relatively well to real life so players shouldn’t have much of an issue at quickly picking it up. 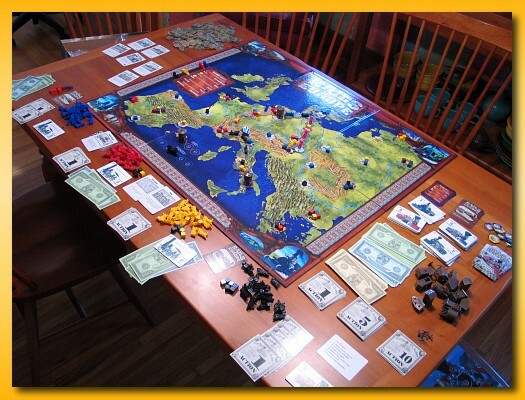 Author mattPosted on May 24, 2009 January 27, 2016 Categories All Posts, Board GamesLeave a comment on And…..They’re Off! Last night, Lisa and I held the second installment of Saturday Night Gamers – SNG. Our first attempt was mostly a trial run with couples and we’ve made a few changes this time, broadened the guest list a bit, and announced that it will be a monthly activity for us. 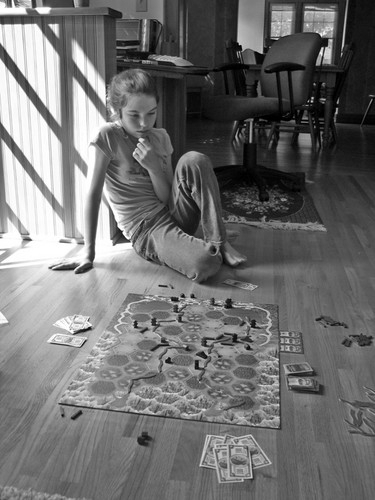 We know that everyone has busy schedules and ad hoc game nights just don’t work in our crowd. It’s got to be something that people can schedule. But we also know that not everyone can come every month and we know that sometimes it may just be Lisa and I but we’re fine with that. Our first monthly SNG (again packed with food, wine, and beer – I’ve got to get Lisa to back off on the food!) was a tough one to schedule for many. With the summer months coming people are just darned busy. But, we did manage to have seven total which is a comfortable number for playing two games. We split into two groups and I taught Saint Petersburg to three others and the other group played Stone Age. I’m still struggling a bit with the format but I think we’ll get there eventually. We spend a relatively large amount of time just chit chatting, eating, etc. and the gamer in me wants to get down to business but the logic side of my brain knows that relaxing with friends is just as rewarding. We’d like to keep it a gaming event but not in a way that’s tense or competitive. Sort of a gathering that happens to include a game or two. I’m also struggling a bit with choosing games to play. Many of the attendees are not gamers but we do have a few people capable of teaching a smattering of games. Last night I pulled out a stack of 8 or 10 games that I thought were appropriate in terms of time and level of difficulty but deciding which games to actually setup and play is difficult. I don’t like to dictate the games since I’ll play most anything but without strong desire for any particular game I guess I’ll have to get comfortable playing that role. I felt a lot of pressure to teach the games to get people up and playing quickly since learning a game cold from the rules is a drag for most people (unless you’re weird like me and enjoy learning a new game by yourself with a pot of coffee handy). I think next time I’ll grab a game or two I’d like to teach/play, hold them up, ask for players, and let another group splinter off and pick for themselves. Everyone may be happier with that approach. Time will tell. Unfortunately I forgot about taking pictures until around 10pm after my group was done with Saint Petersburg and a round of Lexio but I did manage to get one of the group playing Stone Age. I think everyone had a good time and we hope to see you all next month if you can squeeze us in. Pardon my crappy pictures this month. My camera was on a manual setting that had the wrong lighting type for the room casting everyone in a horrific orange glow. I did my best in Paintshop Pro. 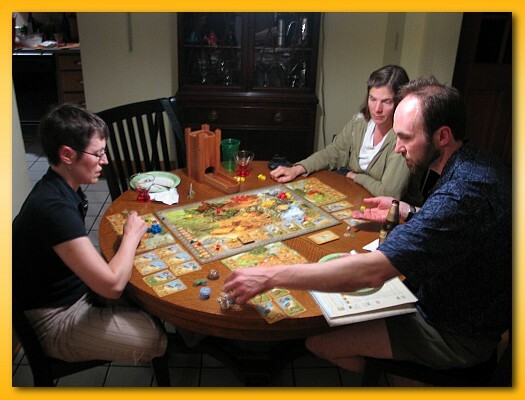 Seven of us met at my house for May’s installment of Analog Game Night. After burying ourselves in food and drinks we perused the game shelf and pulled out Notre Dame and Hamburgum. Notre Dame is listed as 75 minutes as is Hamburgum but given that Hamburgum was new to our group we split into 4 for ND and 3 for Hamburgum in hopes of having them end roughly at the same time. Unfortunately, the four playing ND had a long haul through the rules (it had been a few years for most of them) and my end of the table finished with time to spare. While waiting we played five rounds of Lexio. After Notre Dame finished up, we lost a couple players and with five we pulled out Ra. I’ve played Ra enough that I can teach it without consulting the rules (I do need the rules for the starting sun configurations). The game was rather strange in that the auction track was really filling up but people were really hesitant to call for the auction. In that situation it’s painful to watch beautiful melds of tiles going to the highest bidder when you have no hope of winning. I was calling Ra every chance I could get but there were times when I needed floods or I didn’t want to swap a high sun for a crappy tile for the next round and round and round it went with nobody calling Ra. During one particularly sweet moment with three of us left with suns the Ra track had only two openings. I had the highest sun so when the next to last Ra tile was pulled I took the tiles and the next tile was the last Ra leaving two other players in the dirt. Unfortunately that was the highest point of my game ending the game near the end of the pack. I enjoyed Hamburgum quite a bit even though I came in a distant third. The rondel provides some tension but I was somewhat disappointed in the level of tension in the game. I had hoped for more…somewhat akin to Tigris and Euphrates. I do like that there is no random element in the game and that, for the most part, play is extremely swift. Once you decide what it is you want to do, you can quickly take your turn and before you know it, it’s your move again. I built the first church so became the first player with the freedom to build where I want but in the end it didn’t matter much. I wasn’t paying much attention to what regions I was building in and was focussing on maximizing certain buildings to coincide with a building multiplier I’d gotten from a church donation. In the end, however, my multiplier didn’t pay off and by that time my scattered building chips were relatively worthless for the “people” multipliers for the different regions. I’d really like to play a couple of games back-to-back to let some of the strategies sink in. If you’re good…the picture above shows a mistake we made and recognized late in the game. We had another rules slip as well (allowing people to buy more than one special building during a turn – I’d forgotten about that limitation) but I don’t think either infraction affected the game. 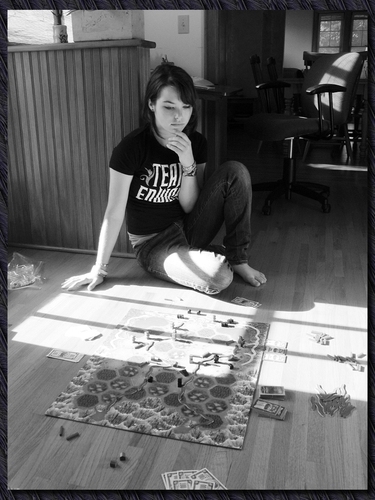 I’ve been playing simultaneous games of T&E on BGG and the strategies there are not subtle. There are some relatively sneaky moves but for the most part, moves are dramatic. I’m surmising that Hamburgum is a more subtle game, and my hopes are that my somewhat depressed enjoyment level is inappropriate given a few more plays. Thanks for coming guys and I’m looking forward to next time.